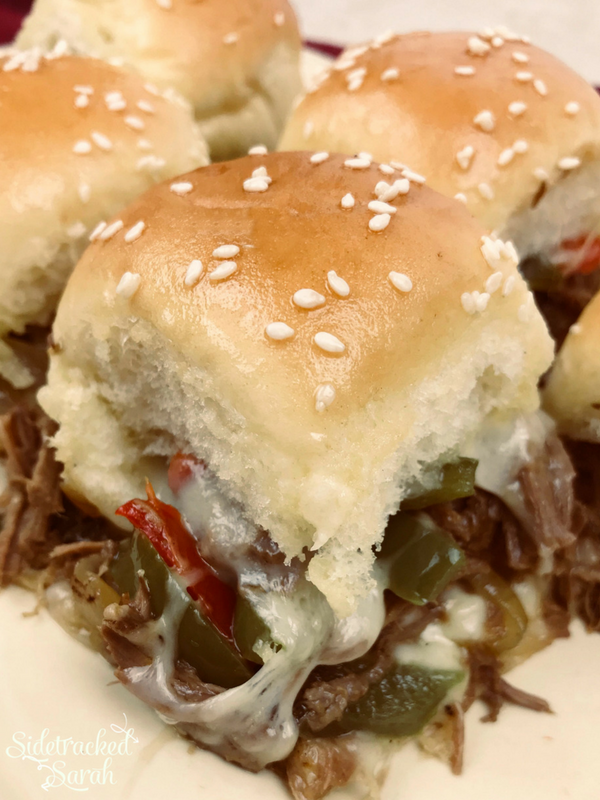 Crock Pot Philly Cheese Steak Sliders – It Is One Of Those Recipes That You Will Come Back To Over And Over Again! With Plenty Of Cheese, Peppers And Delicious Meat, You Can’t Go Wrong With These! We love slow cooker sandwiches and dishes including these favorites, Slow Cooker Texas Pulled Pork Recipe and Slow Cooker Pineapple Pork Tacos. Sometimes sandwiches are just what hits the spot – but not just any sandwich will always do! 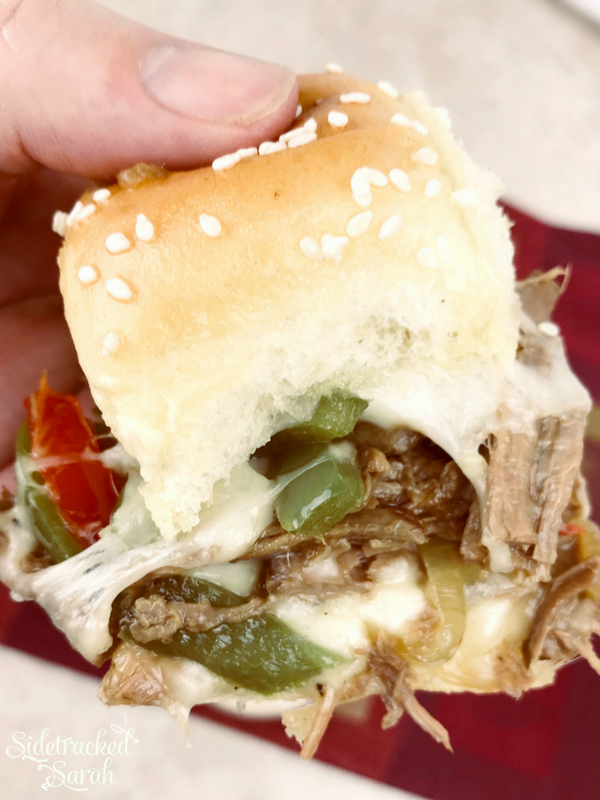 These Crock Pot Philly Cheese Steak Sliders are those types of sandwiches that win over any crowd, at any time! Oozing with delicious cheese and bursting with favor, these sandwiches are by far some of my favorites! 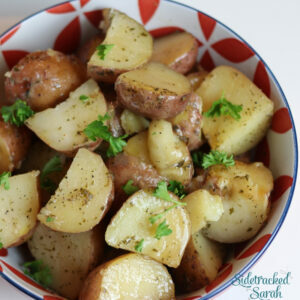 Easy to make and perfect for any dinner, party or event, I love pulling out this recipe any time I need a quick fix that I know will be scrumptious! Plus, it’s not an expensive recipe, which makes the deal even sweeter! SHOULD THE ROAST FOR THESE CROCKPOT PHILLY CHEESE STEAK SLIDERS BE SHREDDED OR CUT BEFORE IT GOES INTO THE CROCK POT? Shredded is best! If you just slice it, you could end up with just hunks of meat and that’s not too delicious. HOW MANY CROCK POT PHILLY CHEESE STEAK SANDWICHES DOES THIS MAKE? The recipe should make enough for 12 sandwiches. 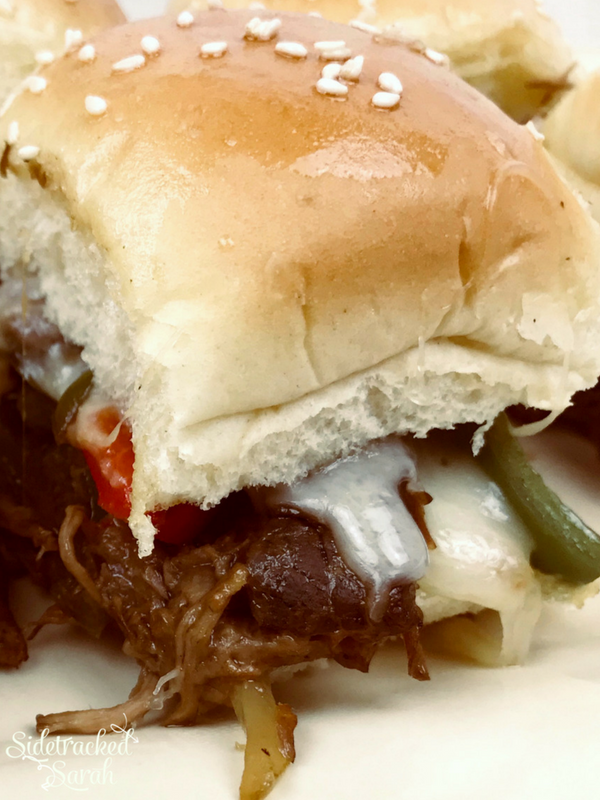 WOULD CROCK POT PHILLY CHEESE STEAK SLIDERS FREEZE WELL? I wouldn’t freeze it as a finished sandwich, but the meat mixture should freeze well, allowing you to make these delicious sandiwches at a later date for whatever event you have planned! 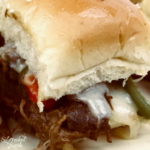 Crock Pot Philly Cheese Steak Sliders Is One Of Those Recipes That You Will Come Back To Over And Over Again! With Plenty Of Cheese, Peppers And Delicious Meat, You Can't Go Wrong With These! Pour soup mix, gravy mix, and pepperoncini over beef roast. Cover and cook on low for 8 hours or until fork-tender. An hour or two before roast is ready, slice onions & peppers and place in slow cooker until tender. Slice rolls in half horizontally. Place bottom half in a 9x13 casserole dish. On top of rolls, place provolone cheese. Add the beef mixture and spread evenly. Add the swiss cheese over the beef mixture and finish with the top of the rolls. If desired, brush the tops of rolls with butter and then sprinkle with sesame seeds. Cover with aluminum foil. Bake for 15 to 20 minutes until thoroughly heated and the cheese is melted. Cut apart and serve. 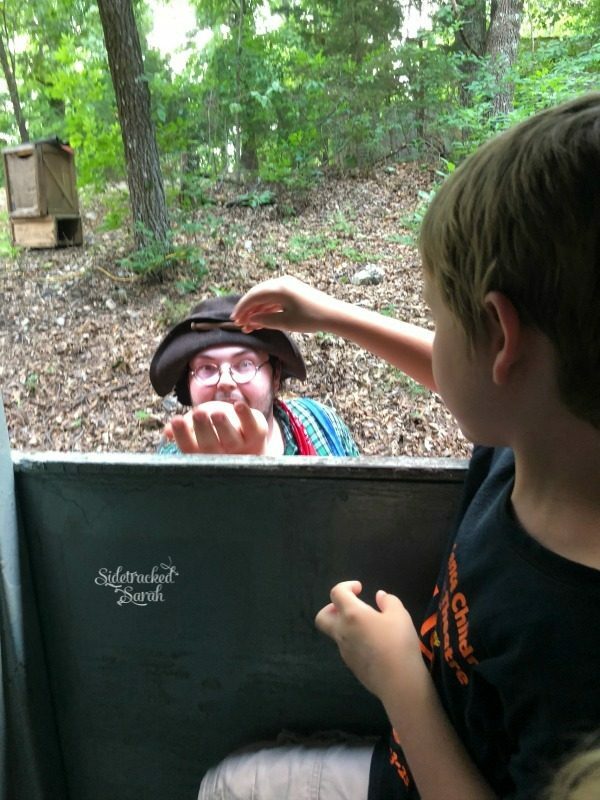 Last week, we went to Silver Dollar City in Branson, MO with our whole family and Ryan and I took the little 2 kids on the train. Each time you go on the train there, they “rob the train”. This is a picture of my son, handing the “robbers” his money. A whole 11 cents.